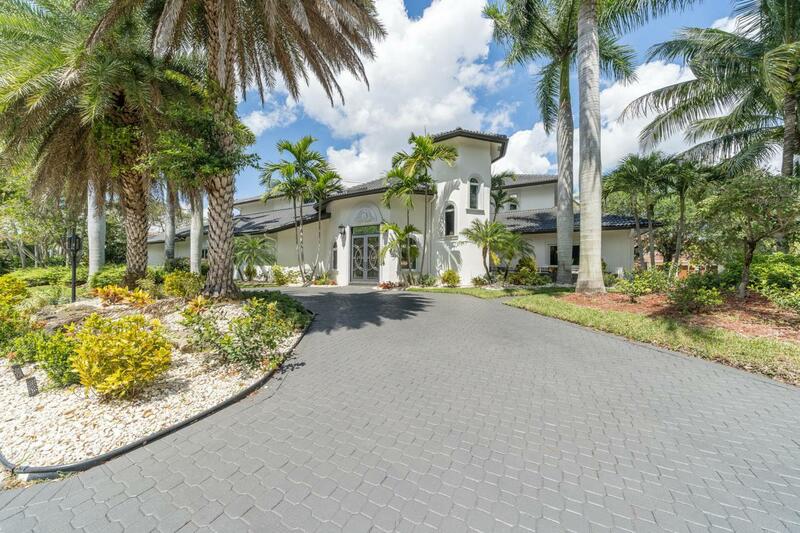 WOW MUST SEE THIS SPECTACULAR ESTATE HOME ON AN OVER SIZED CORNER & CUL DE SAC LOT WITH .42 ACRES ON THE GOLF COURSE WITH LAKE VIEWS & OVER 8000 LIVING SQ FT OF PURE LUXURY!ALL HURRICANE IMPACT WINDOWS & DOORS, CHEFS KITCHEN WITH GAS COOK TOP, 2 OVENS, WARMING DRAW & MORE, MARBLE & STONE FLOORS THROUGHOUT THE 1ST FLOOR & WOOD FLOORS ON 2ND LEVEL. 2 OVER SIZED LOFT AREAS, WINE ROOM WITH CAPACITY FOR 300 BOTTLES TEMPERATURE CONTROLLED WITH WET BAR , WET BAR IN LIVING AREA SAUNA, ELEVATOR, MEDIA ROOM, CABANA BATH WITH A SAUNA, IN-LAW SUITE OR MAID SUITE WITH PRIVATE ENTRANCE, MASTER HAS STEAM ROOM SHOWER, BREAKFAST BAR, BUILT IN REFRIGERATOR WITH ICE MAKER & FIRE PLACE, POOL RESURFACED , INTERIOR& EXTERIOR RECENTLY PAINTED. THIS HOUSE HAS IT ALL. WALKING DISTANCE TO HOUSE OF WORSHIP,RESTAURANTS & SHOPPING. Listing provided courtesy of Re/Max Services.